02.11.17 12:41;Account;Receive;Received Payment 1.7 USD from account U13776657 to account U1294000. Batch: 193650043. Memo: Shopping Cart Payment. Withdraw to all-hyips.info from capitalgroup.online. 04.11.17 17:39;Account;Receive;Received Payment 3.4 USD from account U13776657 to account U1294000. Batch: 193903824. Memo: Shopping Cart Payment. Withdraw to all-hyips.info from capitalgroup.online. 07.11.17 17:48;Account;Receive;Received Payment 3.4 USD from account U13776657 to account U1294000. Batch: 194222196. Memo: Shopping Cart Payment. Withdraw to all-hyips.info from capitalgroup.online. 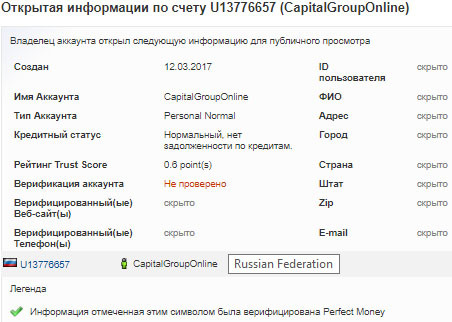 07.11.17 17:45;Account;Receive;Received Payment 1.7 USD from account U13776657 to account U1294000. Batch: 194221953. Memo: Shopping Cart Payment. Withdraw to all-hyips.info from capitalgroup.online.